454,814 housing units would be left from 2018 for sale in 2019 with a total value of USD 41 billion. This implied to all types of housing across Thailand catered by real estate developers. The supplies in the Bangkok Metropolitan Region constituted 40% of the total units available and 55% of the total value. This meant that Bangkok has become the only primate city in Thailand. Dr.Sopon Pornchokchai, President, Agency for Real Estate Affairs which is considered the first and largest real estate information centre since 1994 found that as of end 2018, there were some 454,814 units left for sale which would be available in 2019. These supplies included detached houses, semi-detached hoses, townhouses, shophouses, condominiums (owner-occupied apartments) and residential land subdivision catered by formal private housing developers in Thailand. The total number of housing units in 2018 was 26,224,081 units (https://bit.ly/1JYzpvJ, 2017 data with the previous growth rate). Therefore, the number of supplies from private developers at 454,814 units was accounted for 1.73% of the total existing housing stock. These 454,814 units could be absorbed within 2 years. Consequently, the number of units sold each year could be 227,407 units. In the United States, some 4.07% of the total housing stock were sold in a year (https://bit.ly/2lXcpon). In the case of Thailand, it might be asumed at 2.5% Hence, the number of existing units sold in the market should be 655,602. Eventually, it was estimated that the proportion between developers home sales and existing home sale would be 3:1 (655,602 : 227,407). The number of units left was around 30% of the total supplies as of end 2018. In other words, most of the supplies (70%) were absorbed by the buyers. The total value of the developments was Baht 1.344 trillion or USD 40,738 billion which was accounted for 45% of the fiscal budget of the Government of Thailand. In addition, a housing unit available in Thailand was Baht 2.956 million or USD 89,576 which was 33% of the median house price in the United States of America at USD 276,000 (https://bit.ly/2sVEDpX). Furthermore, 3.2% was the average rate of sale per month of housing projects in Thailand. The largest supplies were in Bangkok with a total number of units of 91,600 units (20% of the total). 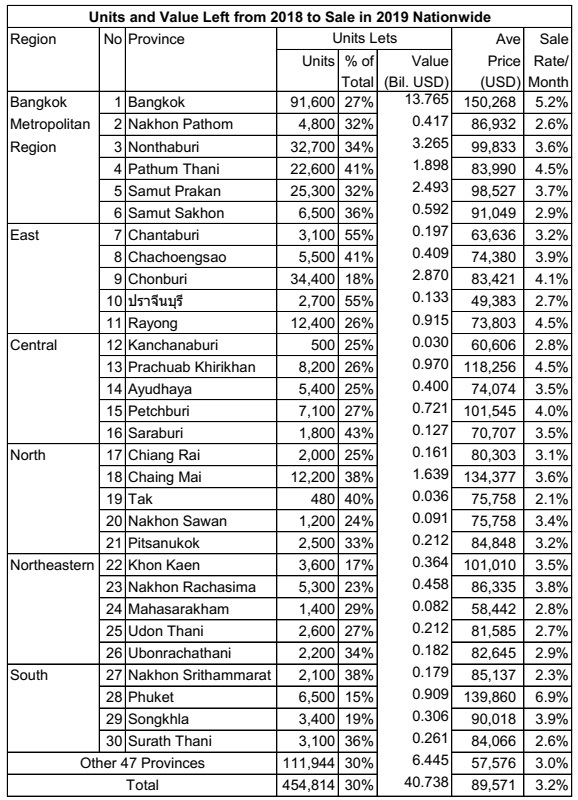 Chonburi in the east was the second with a total supplies of 34,400 units (8%) followed by Nonthaburi (32,700 units, 7%), Samut Prakan (25,300 unites, 6%) and Pathum Thani (22,600 units, 5%). As a whole, the first five cities constitute some 45% of the total units left for sale as of end 2018 which would be entered into 2019; whereas, the Bangkok Metropolitan region (Bangkok and other five vicinity provinces) constituted 40% of the total supplies. The total value of the 454,814 units left was Baht 1.344 trillion or USD 40,738 billion. Bangkok constituted USD 13.765 billion or 34% of the total value. In the case of the Bangkok Metropolitan Region, it constituted some 55% of the total value. Ten yeas ago, the proportion was only 50%, this meant that the size of the primate city of Bangkok has been enlarged over time. As observed regional cities were of shrinkage over time. This was because of the poor economy in upcountry. However, some regional cities were exceptions such as firstly, border cities with a large volume of border trade, secondly, resort cities where money was injected from tourism and thirdly, industrial cities particularly those in the Eastern Seaboard and the like. It could be observed that the Bangkok Metropolitan Region, Chachoengsao and Chonburi and Rayong in the Eastern Seaboard Region would be merged together. This would appear the state of the megalopolis of Bangkok with a vast urban field. Provinces with better sale performance included Phuket with the rate of sale of 6.9% per month; whereas, it was 5.2% in the case of Bangkok. Two resort provinces of Prachuabkirikhan and Rayong have also a better sale of 4.5% per month as well as Pathum Thani which was a vicinity city of Bangkok. In turn, Tak, Nakhon Srithammarat, Prachinburi, Surat Thani and Ubon Rachathani were among those with the lowest rate of sale. The markets might be weak. In Thailand, there were 77 provinces. Apart from the Bangkok Metropolitan Region, the Eastern Seaboard and some regional cities, markets in other provinces were rather small. There were some 47 provinces which totally had the size of the supplies of Bangkok alone. However, in smaller provinces, the rate of sale was slower than in Bangkok. Considering the average price at USD 89,578, it was considered cheaper than that in Hanoi, Hochiminh City, Kuala Lumpur and Phnom Penh which were over USD 136,000. However, this average price would still be higher than that in Jakarta and Manila which were below USD 80,000. Actually, there is no housing shortage in Thailand. Most of the household can afford a house in an open market.